So I've decided to start blogging and posting pictures of my latest crafty projects. (These may include but are not limited to cardswap cards, scrapbooks, scrapbook pages, or other miscellaneous things!) Hope you enjoy! This page was my first try at digi-scrapping. 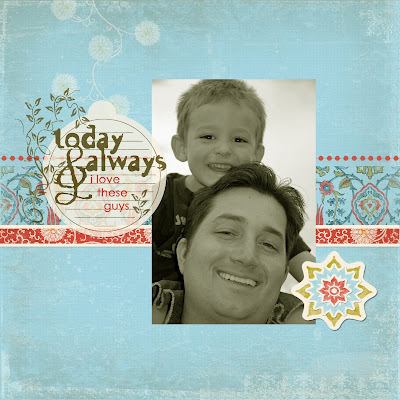 It was from a free kit I got off of the Creating Keepsakes website last year by Jessica Sprague. This was a template, so all I had to do is add the picture and type some journaling, which is why I was actually able to do it! I have tried for over a year to comprehend this whole digi-scrapping thing! I've bought several books and still didn't get it. I've watched online tutorials I don't know how many times and still didn't get it. 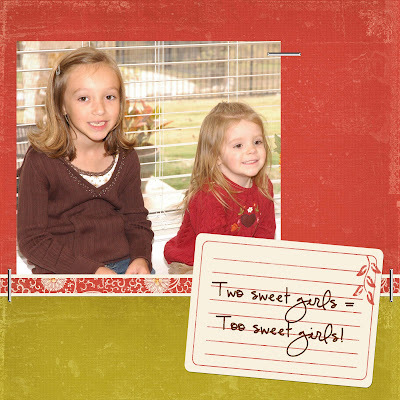 Finally, on Monday, I purchased a CD called Digital Scrapbook Memories Beginner Series from Hobby Lobby, and I finally get it! YIPPEE!!!!! I have downloaded so much free stuff over the past year and now I can actually use it, well most of it anyway. I still don't understand all of it, but at least I'm not screaming in frustration any more. Thank you Digital Scrapbook Memories people. Whoever you are. Here's a page I did from scratch after watching the tutorials from my CD. It's a little sparse, but I don't have many elements like flowers or anything, YET!